Home / Entertainment / Video / Watch: Alden Richards shares on how he courts a girl! Watch: Alden Richards shares on how he courts a girl! Get to now more about Alden Richards about his way on courting a girl, what he likes and hates about a girl.Watch it here! 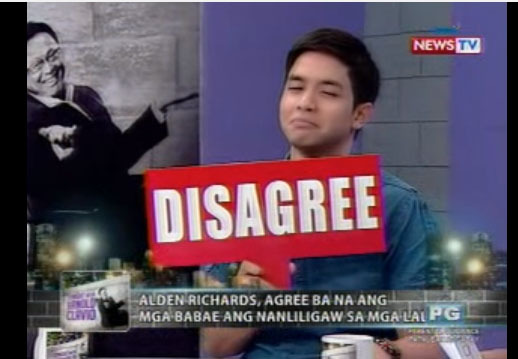 Arnold asked Alden what he feels with so many girl having liking him and having a crush on him. Alden being a very humble person said that he was flattered and honored that many people are appreciating his work that it he became more inspired because of them. During that time, Alden shared that his last girlfriend was when he's still in highschool and they lasted for 1 year. According to him, it was his longest relationship. After talking about his relationship, Arnold asked Alden of he still believes in making 'pangliligaw'. In courting Alden shared his way of 'panliligaw', he would text them, visit her at home and also the girl's parents. He was asked what are the qualities he is looking for the right girl. Alden likes a girl who's understanding especially with his line of work, also nice and caring. What he hates about a girl? Alden doesn't like a 'maarte', girl with a bad hygiene, and very talkative.